Generally, Boxing is considered to be a more aggressive sport that is unfeminine and more related to men. 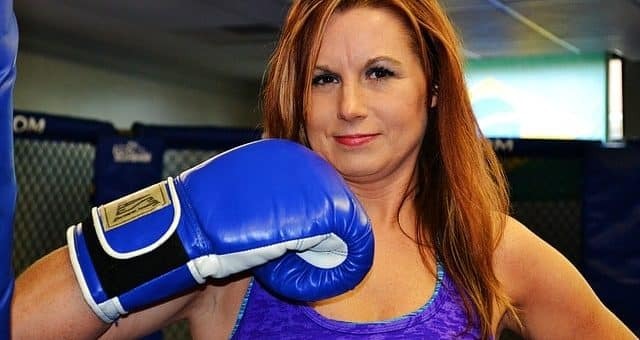 Yet, in spite of the stereotype, boxing has become more popular among women and is no longer seen as only a men’s sport. Many top models and other women are taking up Boxing as a workout regime, because of its many health, physical and mental benefits. While your Boxing Gloves will be one of the most important pieces of equipment, the shoes that you wear may have a huge effect on your speed, agility, and comfort levels, in turn. 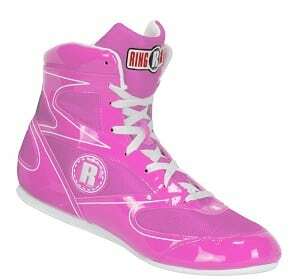 Therefore proper Boxing shoes are a must, if you are planning on taking up Boxing regularly. It is undeniable that Boxing helps women to build a strong and well-toned body that is tough and has stamina. Boxing gives you superb confidence and a feeling of well being that radiates throughout you. Your body will become toned and slim, making you look good as well as feel great. Then again, boxing also aids in relieving stress significantly and gives you something to release your energy and aggression on, freeing you from all mental hurdles. The core workout, whether Sparring, or practicing on punching bags, is incredible to get your body into shape, especially flattening your stomach. Boxing is likewise better than any other form of cardio workout to lose weight, and tone, while it also increases your levels of stamina and strength. Practicing Boxing improves your posture immensely, which can aid to eliminate back pain and other spinal conditions. Boxing has the ability to improve your Reflexes, as well as Hand-Eye Coordination greatly. This improves your reaction and speed of movement, which can in turn, help with other sports and activities. I probably do not have to tell you this, but with Boxing practice you will be able to hand out a mean punch, and effectively defend yourself in a critical situation. Lastly, boxing most definitely burns plenty of calories and fat, as it is a high energy, and strenuous workout. Do not use Wrestling shoes for boxing, these are acceptable when you are a beginner, but not recommended for pro Boxers or seasoned Boxers. You have the choice between a high top or low top boxing shoe, the low top allows faster movement, though the high top offers better ankle support. A shoe that is as lightweight as possible is ideal. Good grip is likewise important, so look for a durable rubber outsole. Breathability is a must, leather or suede shoes are a good option in this case. Make sure that the size is correct, keeping in mind that boxing shoes are more narrow and tight fitting than regular shoes. Make sure there is nothing on or in the shoe that may become an annoyance, such as a stage, uncomfortable arch, or even chafing lining. Durable and lightweight construction and materials. Suede or leather uppers that are lightweight and breathable. Good Forefoot shock absorbency or cushioning. Durable high traction Rubber outsole. High Top for ankle support, Low Top for speed. A sleek and snug fitting Boxing shoe for both beginners and experts in the Boxing arena, with a few stunning color option designs and plenty of comfort and performance enhancing features. A High Top Sneaker ideal for Boxing of all levels and stages. Features Tr-Material uppers with a Glossy Patent leather and PU leather Flex, as well as Honeycomb Mesh construction, which offers ideal flexibility, and breathability along with an appealing style. The rubber outsole is designed to offer the best in traction and grip in the areas you need it the most, along with optimal stability and long-lasting durability for regular practice routines. An anatomically designed insole ensures that your feet get all the support and comfort that they may need to prevent foot fatigue and injuries. The insole is bonded which aids in preventing slippage and chafing. Available in solid black, with patent Leather; GOLD, SILVER, RED, BLACK and WHITE webbing to choose from. Reebok is a very well know and trusted sports brand that is popular among many sportsmen and women in a variety of sports types. The Boxing Boot for women is designed to specifically fit the fragile contours of a woman’s foot, while providing exceptional ankle protection and stability. The Rubber outsole is thick and shock absorbing, while ensuring excellent traction. The rubber outsole is likewise a white color at the bottom and skid-resistant and non-marking. The textile uppers are made from breathable and lightweight mesh with white patterns and strengthening suede webbing. There is a full lace up system as well as a mid shoe Velcro strap to give you less slipping and a more snug and secure fit. Comes in only one solid Black color with white trimming. The Puma Tazon 6 is ideally a Cross training shoe meant for extreme sports and training, which also makes it the perfect shoe for Boxing and Training. The unique slim fitting and flexible design, with the shock absorbing and high traction rubber outsole offer you the perfect solution, in a low profile Boxing shoe. Flexible and supple synthetic leather uppers for stability with breathable fabric and perforation holes. A durable and high traction rubber outsole that offer exceptional grip on slippery and hard surfaces. There is a TPU shank to improve stability and support. The ECO Ortholite sockliner ensures an optimal fit, superior breathability and flexibility, along with comfortable moisture wicking capabilities. Available in black or white color options with neon color trimmings for you to choose from. I simply love these, the Ringside Diablo Boxing Boots features a very feminine style and color assortment, along with a tough and durable design fit for hard wearing. Breathable Mesh and Nylon uppers with Patent leather vinyl trim. A Low Top ankle boot that offers exceptional fluidity, and ease of movement, along with superb ankle support and stability. The outsole is made from tough and durable rubber with non-slip design. Available in; Black, Blue, Pink, red and White color options for your own specific style requirements. The Title Predator 2 is a unique Boxing shoe with a three-dimensional upper design, to give you a more dynamical and contouring fit, while providing excellent ankle support and protection. The outsole is made from a very flexible gum rubber that is soft and pliable, while ensuring superior grip and traction on hard floors. Available in Black with either Blue, White, Red or Black Bi-Colors. Inside there is a full-length mesh tongue to enhance breathability and air release. A comfort-wrap ankle design ensures the best ankle support. Features a spongy and soft fit with a cushioned comfortable footbed. The three-dimensional uppers are anatomically designed to contour and fit your entire foot, ankle as well as lower calf snugly and securely.